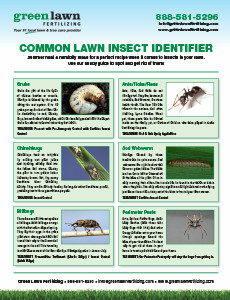 Unlike the common earthworm, grubs, or the larval form of various insects, are terrible for your lawn. 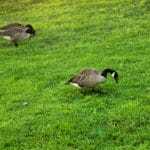 They are most prevalent in summer, when insects are plentiful and the moist grass of well-tended lawns provides an attractive site for them to lay their eggs. Learn to recognize and address grub problems before they have the chance to make your lawn miserable. Check for Brown Spots – Though summertime is a normal time to see brown spots forming in your lawn, these spots can be formed by underground grubs that have weakened the roots of the grass. This is an indication that you may have a grub problem, but is not definitive. 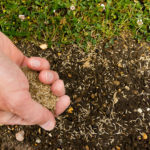 Dig Up the Grubs – Once you have noticed isolated brown patches and are wondering whether grubs are the culprit, finding out can be as easy as digging four inches down into the ground. If you find 10 or more pale, slimy looking, c-shaped grubs within a single square foot, they are probably the cause of the browning of your lawn. Feel for Soft Ground – Soft or spongy ground may indicate loose, root-stripped soil that grubs have been munching at. Unaffected areas will be tougher due to still being held together by the grass roots. Test the Strength of the Grass – Grubs’ favorite food is grass roots. 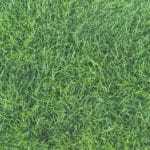 If the roots of your grass have recently been munched away, the grass may still look green (temporarily), but come out too easily when pulled. Check for Holes in the Lawn – Wild animals find grubs delicious and will happily dig up your lawn under the cover of night to get at them. If you have a grub infestation, you may start to notice that your lawn is getting dug up by creatures like raccoons and skunks. Be sure that the dug up earth is not actually a molehill, as molehills are not an indication of the presence of grubs. One way to avoid grub problems is to allow your lawn to go dormant in the summer, making it a less hospitable area for bugs to lay their eggs. 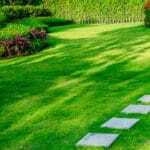 However, if you can’t bear to see your grass go dry and brittle but find yourself faced a grub infestation, the local lawn care pros at Green Lawn can help you fight them.